Yes, it’s another grain + tuna + veg + pulse salad — last week’s farro salad leftovers were three lunches for me, very convenient. I was lucky to find a rented room for two months with super nice colleagues, but they are moving house within Accra sometime in February. However, they may very kindly take me with them, so I am doing my best to be a considerate flatmate in my old age, and we have started househunting together. 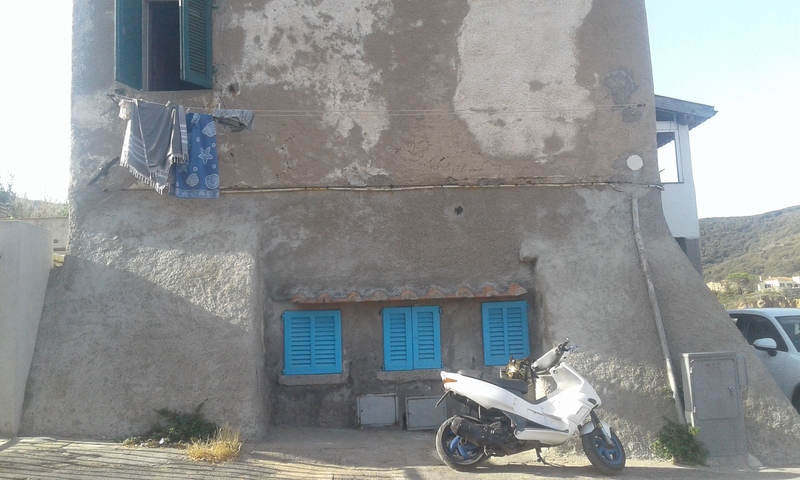 Interesting to see how the market has changed since I arrived in 2015: more places available, but many are still rather expensive: 2500 – 4500 USD for three bedrooms, sometimes unfurnished. We shall see. All my kitchenware is packed away in bags in a spare room, so I am very lucky also to have access to a well-equipped kitchen here. Thinking of another sweaty move across Accra soon, there is definitely a need to use up any heavy tins, which is usually not a factor in my mealplanning. Another year in Accra was not foreseen, and being apart from my husband is very hard, so it is extremely tempting to sink into despondency and the stash of post-Christmas chocolate. To keep morale up, I am trying to eat properly and exercise a bit, and see friends, so this repeat salad is a small step in that direction. Ah, harmattan: dusty dry weeks in Accra. There has been sun and increasing humidity the last days, so maybe harmattan is ending early this year. I soaked the orzo for a an hour, covered with water room temperature, then boiled it 15 minutes or so. We have drinking water delivered in handy 19.5 litre containers, but I have gotten more relaxed about using tap water for cooking. The most common water-borne diseases in Ghana are typhoid, cholera and dysentery….. but [touch wood] so far it seems to be OK for cooking as long as water boils at least ten minutes. Cook the soaked orzo in salted water (like you would cook pasta) until it is al dente but not not crunchy, 15 minutes or so. The packet said 25 minutes when unsoaked. You could use other grains for this as well, or rice. It will be softer than boiled farro. Drain off cooking water. While still warm, crumble over the tuna. Here I added in the olive oil in the tuna tins, as it was decent quality, otherwise if you are using tuna in water or blander sunflower oil, you might want to drain the tuna first and add a couple tablespoons of good olive oil with the tuna to the warm grains. Add in drained beans and chopped veg. Salt and pepper to taste. I’ve been reading UK food magazines from Christmas holidays today, and taking notes for what I could make with what we can access easily here. Sweet potato curry, lentil soups, falafel wraps, spinach fritatta…… The Guardian has also had some great vegan recipes this month, to be explored. Enjoy your weekend! This entry was posted in food and tagged beans, living in Accra, orzo, salad, tuna on January 13, 2018 by krumkaker. Happy New Year! After a month in Rome, then Christmas holidays, I am back in Accra. Hazy and dry here, with the harmattan (a trade wind) cloaking the city in dust. Here, Oxford Street. The skies are hazy and humidity is low. The move to Rome is not happening yet, and I am back alone for now, which has been miserable. With nowhere to live, and temporary accommodation so expensive here, at least I was fortunate to have found a rented room for two months. (The office here was not expecting me back either, I had no desk when I came back….) So this week after work I’ve been sorting out basics: food, sheets, and trying to get into a less demoralized mindset. It is really hard with my husband back in Europe, due to upcoming work for him, as we thought we’d both be back. Whatsapp helps, even on on intermittent wifi. Last night he made pizza in London, and I made farro salad with borlotti beans, tuna and celery. And I thought my old kitchen had terrible lighting……. It’s actually a pretty decent kitchen in the new flat, despite the small marauding ants, and I have stuffed my fridge shelf with food brought along post-Christmas: Norwegian caviar tubes, apple jelly and goat cheese; English butter and cheddar (hence the half-eaten quesadilla in photo); a wedge of Christmas cake from my mother-in-law. I also had some Italian tins stashed away, hence this salad. Farro is an old kind of wheat, quite chewy after cooking, and nice in salads. I do not like cooking just for myself, but cannot live on instant soup the next two months either…. This is more assembly than cooking, really. I soaked the farro for a few hours, covered with water in the fridge; it is not really necessary, but as there is a gas cooker here and I am not sure how much gas is left in the canister, soaking saves a bit of cooking time. This will also be lunch for a couple days this week. Cook the soaked farro in salted water (like you would cook pasta) until it is al dente but not not crunchy, maybe 20 minutes or so? You could use other grains for this as well, or rice. Drain off cooking water. While still warm, crumble over the tuna. Here I added in the olive oil in the tuna tins, as it was decent quality, otherwise if you are using tuna in water or blander sunflower oil you might want to drain the tuna first and add a couple tablespoons of good olive oil with the tuna to the warm farro. Separately, drain and rinse the tin of beans, and chop up half an onion and the celery (here: Waitrose essentials celery, carefully brought from London…). Once the farro has cooled a bit, toss it all together and add some salt and pepper if you think it needs some. It will keep nicely in the fridge for a few days. I may add some feta or halloumi to liven it up for a later lunch. And now I had better post this before the seventh wifi crash of the morning! PS yes, there is probably a solution for improving the wifi connection here, otherwise I will go get a data bundle and a mifi device. Thank goodness for downloaded podcasts and ebooks. This entry was posted in food and tagged beans, farro, living in Accra, salad, tuna on January 7, 2018 by krumkaker. Too much travelling the last few months, too little cooking. We just finished a lovely week off the Tuscan coast with friends. I am recovering from food poisoning (never again samosas in Dar es Salaam…..) so ate little and cooked less, but this dish went down well. 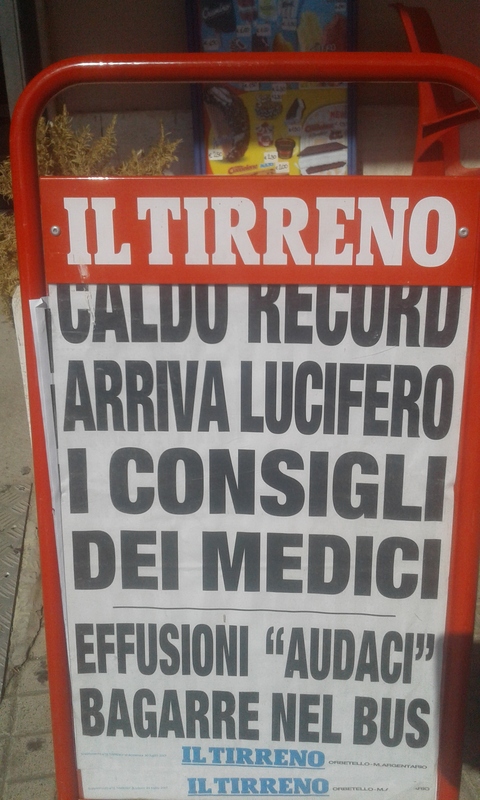 Italy is also in the grip of the heatwave named Lucifer. HOT here! 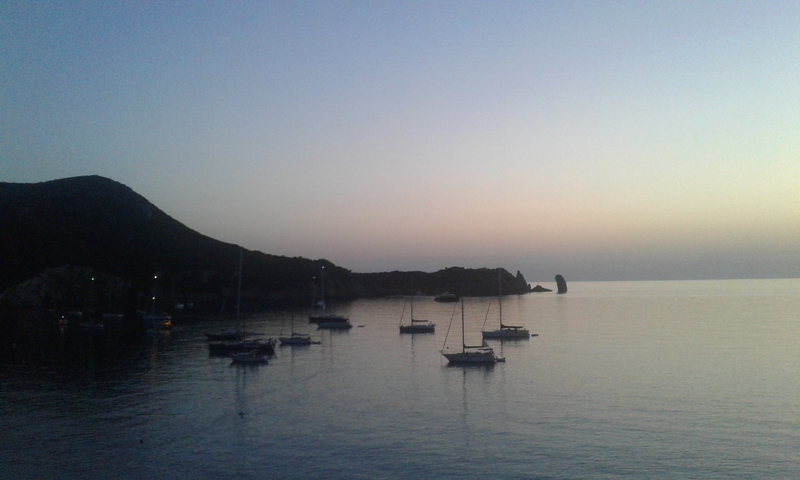 Same island every year, always wonderful. It seemed a bit quiet this year, the Italian economy must still be down. But we had a great week! 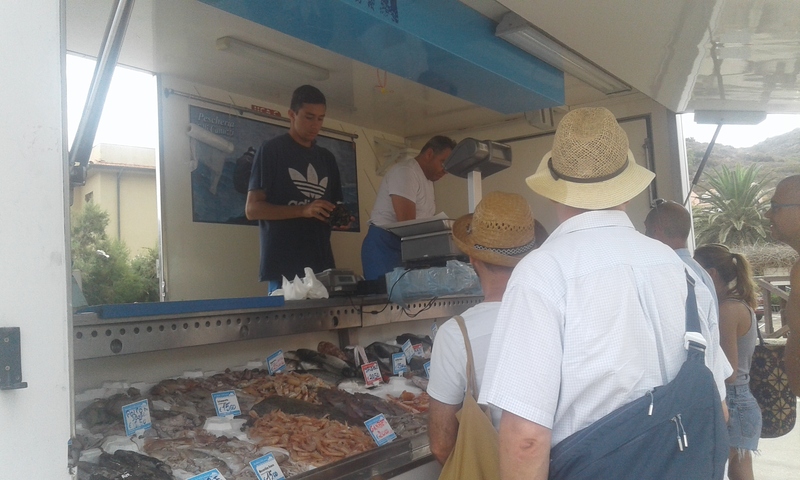 Fresh fish and seafood from the fish truck, shouting Pesce Fresco each morning. Cataplana debut! I bought this in Lisbon in June, took it back to Accra, but decided this holiday was a good time to try it. Special pan for steaming shellfish, it clamps shut like a low level pressure cooker and worked really well. 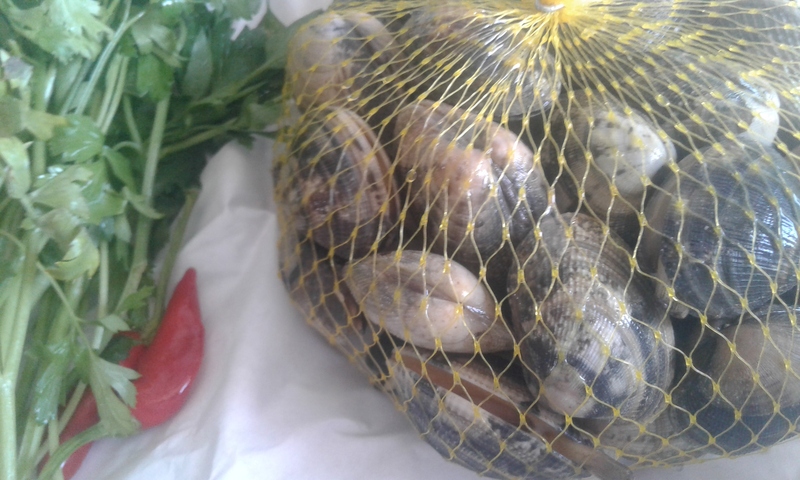 First: soak clams in water in sink for half an hour, removing any damaged ones or ones that do not close. 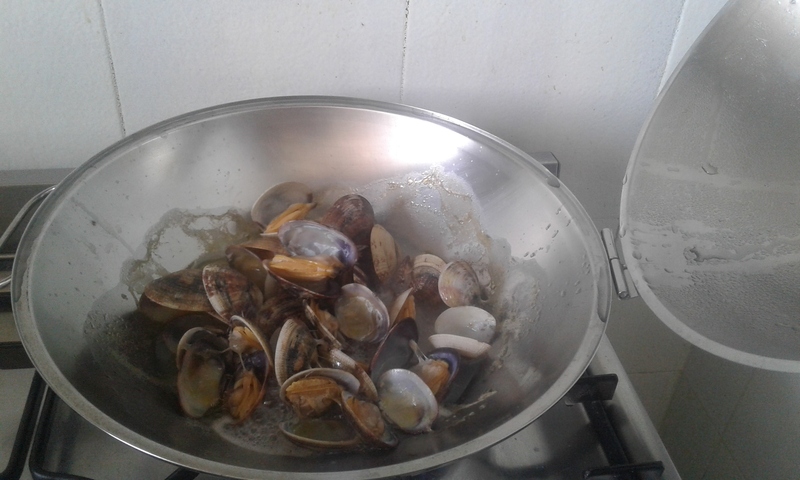 Hear pan with a little oil and white wine or water, tip in handful of clams and steam 4-5 minutes with lid on. You will hear clams pop open. With a slotted spoon fish out done clams and do next batch, I did this in three batches so they were not crowded. Leaving liquid in pan, add sliced leeks and garlic and cook 2 or 3 minutes while you de-shell clams and remove any that did not open. Optional step, we were waiting for a lunch guest. 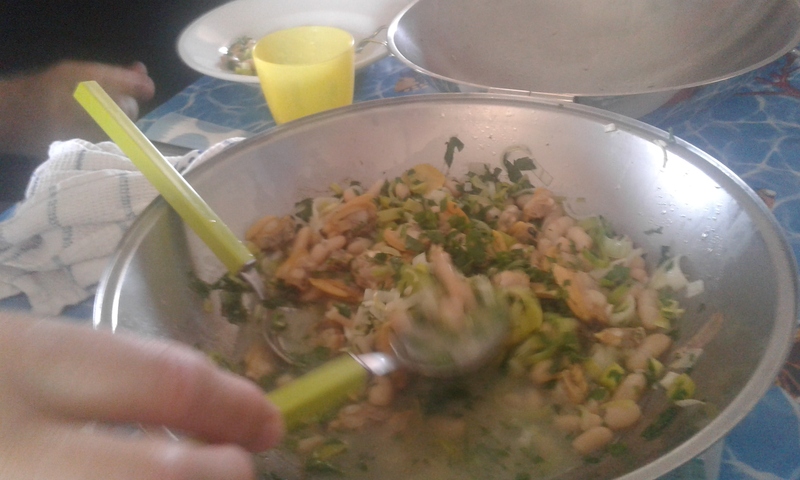 Then add drained beans, chopped parsley and clams and heat briefly through. Maybe half a lemon squeezed over? Serve with toast or crusty bread. This entry was posted in food, Italy, travel and tagged beans, seafood, summer, Tuscany on August 7, 2017 by krumkaker.